Paul is angry with Beverly for reporting the food poisoning cases to the Health department. He tells Jim to tell her she's sacked. Helen is surprised that Jim didn't defend Beverly to Paul - she thinks he hasn't come to terms with Beverly's career. Melanie and Kelvin are snogging again and getting distracted from dancing. Melanie says you can tell a lot about a person by the way they dance(!) She tries Kelvin out with the tango and he does quite well. Joe is encouraging Sky to put different shaped blocks in holes on her toy. Kerry suspects that Lochie has helped Sky build things with her blocks, but Lochie lies and denies it! Todd, Josh and Melissa are hanging out. Josh suggests trying out a model plane he's built, but Todd would rather go roller-skating. He offers to teach Melissa and Josh. Josh isn't keen though - he isn't too good on skates. Kelvin and Melanie are having a very long snog and don't notice when Joe comes in with Jamie. MELANIE: I'm just teaching him how to dance. JOE: What, the horizontal rumba?! Just take it easy on him, Mel. I don't think he's ready for the advanced classes yet! Melanie takes Jamie - Des isn't home yet. (Des hasn't been seen in these parts for a few weeks actually!) Joe tells Melanie that Sky is a genius. Melanie says Jamie is quite smart too, but Joe says Sky is a gifted child. He's worried that it will cost him a fortune when Sky's older. Melanie wonders where Sky gets it from - her mother or her natural father? Todd and Melissa are talking about Josh. He's clearly still upset that Melissa and Josh have been spending so much time together for the quiz. But Melissa reassures him that she and Todd both love each other. JOE: Kerry? I've been thinking about me being Sky's Dad. KERRY: What do you mean? JOE: Well...I didn't do very well at school, you know? What can I teach her? How to fix a tap and dig a flamin' hole? KERRY: Is that what was keeping you awake last night? JOE: Yeah. Well I was sort of wondering you know - her real father, was he a pretty cluey sort of bloke? KERRY: Well, he was charming and witty in his own way. But Joe, he was no intellectual. Sky loves you. As far as we're concerned, you are her real dad. She's never known anyone else. You're the best dad she could possibly ever have. KERRY: Sure. We wouldn't have picked you otherwise. We're very fussy. Mike has rung to speak to Des, but he's not at home, even though it's the weekend. Kerry comes round to see Melanie and she says Kelvin is the best kisser she's ever known. He's not really her type at all, but physically he is very good(!) Kerry says chemistry can work in strange ways and bring unlikely people together - like her and Joe! MELANIE: Do you ever feel...weird being married to him? KERRY: If you mean embarrassed, no. People don't have to be alike to love each other. In fact, I think it's better if they aren't. KERRY: Well...there wouldn't be any surprises, would there? It's half the fun. Kerry is surprised that Des is at work again - apparently he's trying to make a good impression so as to get a job as a new financial controller. Todd is showing off his roller-skating prowess. Josh and Melissa are chatting about Todd - Josh thought he might be jealous of him, but Melissa says they've sorted it out now. 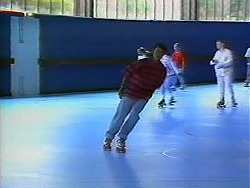 Josh skates off and promptly falls over. Toby is on the phone to Kerry. KERRY: We all miss you a lot. Even Lochie. Lochie sneaks in and does one of Sky's puzzles, but Kerry catches her, looking amused. Des has kicked Melanie out - apparently he was in a foul mood after work - someone else got the financial controller's job. Melanie says she gets mad at the way people walk all over Des - they take advantage of him. Melissa has fallen over and Todd helps her up. Todd isn't being very nice to Josh. Kerry tells Joe that Toby rang - and it sounds like he's doing well. Kerry tells Joe mischievously that Sky and her have had a bit of a talk - Sky wants to take things slowly educationally in case she can't make friends at school. She wants time out from being clever to pick up other qualities from Joe - like being kind, loving and thoughtful. Also filthy, loud and boisterous(!) Joe agrees to back off a bit. Aw. Melissa is frustrated with roller-skating and Josh has already gone off to the side. Melissa invites Josh to lunch, but Todd jumps in and says Josh has better things to do. Suddenly Josh goes off on to the rink and skates very well. JOSH: I kept that a secret because I was trying to do you a favour. You can't get away with putting me down and acting so full of yourself. Thanks, Todd. You're a good mate.